Pulling out the Eating Alaska pins and postcards for a screening today to the International Master Gardener Conference: 9 and 11 AM in Sitka at Harrigan Centennial Hall. The conference includes over a thousand Master Gardeners* on a cruise ship making a stop to find out what eating local means here. • What is the most healthy, safe and sustainable ways for us to be part of the food chain? • What is our ethical obligation to the land and sea? • How is food a bridge between the natural and the social world? 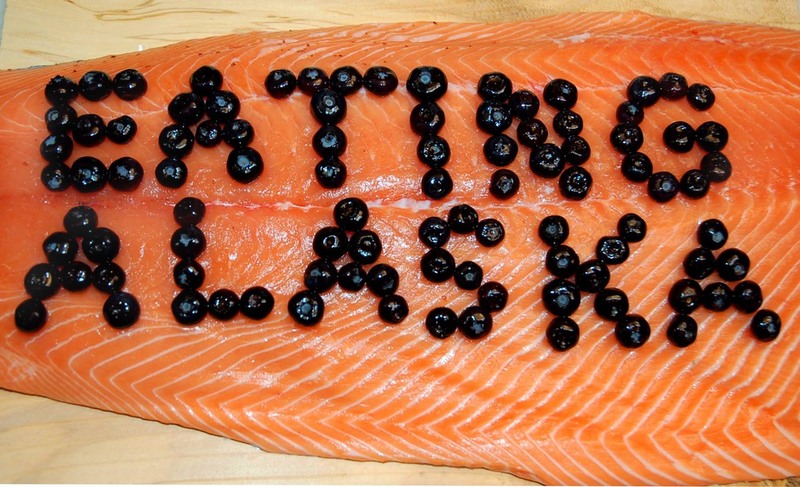 Eating Alaska’s themes include sustainability, health, food justice and local vs. global issues. Public libraries, universities, art houses, Slow Food chapters, environmental centers and churches have not only screened the film, but used it to draw people together with local food potlucks, sustainability fairs, and fundraisers for greenhouses, food banks and farmers’ markets. The potlucks invite viewers to either bring something they “Grew, brew, caught,” or local, organic, fair trade foods. Discussion panels have included vegans, butchers, farmers, wild food harvesters, chefs, artists, and journalists. “Americans’ elevation of the denial of human and animal death to industrial status suggests the importance of keeping dying and killing hidden from view. To look your meat in the eye as you squeeze the trigger to dispatch the bullet to end its life, to walk to the fallen carcass and kneel beside it as you dismember it with a knife, and to feel the burden of the former animal become food as you hike out with it on your shoulders requires intimate familiarity with your food and puts it on a different existential, moral, and cultural footing than the anonymous chicken nugget you buy at a fast food depot. To all but the wealthiest of urbanites who can indulge in hunting vacations, this is a remote possibility, but residing in Alaska made the contrast inevitable for filmmaker Ellen Frankenstein, an erstwhile urban vegetarian struggling with questions of what we eat and how we think and feel about it…. *The Master Gardener (MG) program started in Seattle in the 1970s as a way to extend the horticulture resources of Washington State’s land grant university to the urban horticulture public in Seattle. The Master Gardeners receive 40 hours of training, similar to a basic three-credit-semester-hour, college-level horticulture class. Read more on the Sitka Local Foods Network site. Thanks to University of Alaska Fairbanks Cooperative Extension Service Sitka District office and other planners for including Eating Alaska in the conference.